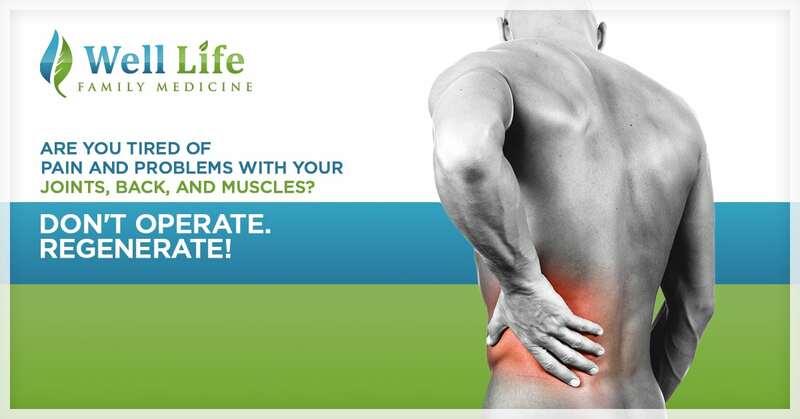 Excessive PAIN in your Joints, Back, or Muscles? Your own tissues might be the solution! Here at Well Life Family Medicine we strive to remain at the cutting-edge of medical innovation. Using the very latest in scientific breakthroughs, Well Life Family Medicine is now offering revolutionary therapies that are designed to harness the healing power of your own tissues! Science is showing that your body’s own stem cells, the special cells in our body that generate all of our tissues, have the miraculous power to heal and restore the balance of your body’s tissues. No matter what situation you are in, Well-Life Family Medicine has the solution for you! Take the Stem Cell Quiz Now! Why should you use regenerative therapies to address your health concerns? If you have pain it can destroy your ability to live a normal life. Here at Well Life Family Medicine, we don’t just provide quick-fix solutions. We pride ourselves on providing the most comprehensive, cutting-edge solutions. Regenerative, cell-based therapies will allow you to harness the power of your own tissues to promote healing from a variety of conditions. Regenerative Medicine is the term used to describe medical treatments that use your body’s own growth factors and stem cells to accelerate and repair damaged tissue. Keep reading to learn which is right for you! Stem-Cell Therapy is a safe, non-invasive, non-surgical treatment for a variety of conditions that harnesses the power of your body’s own stem cells. Stem cells are immature cells that have not decided what type of tissue they want to become. Stem cells divide and grow to eventually become all of the tissues in your body. 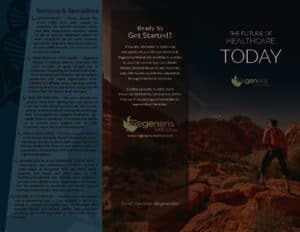 Modern science has unlocked the power of stem cells and they can now be extracted easily from your own bone marrow or fatty tissue, isolated, combined with growth factors or other necessary components, and then injected using accurate ultrasound guidance into effected areas to jump start healing in damaged or aging tissues. Who should have Stem Cell Therapy? Have a condition that you think might benefit from stem-cell treatment? Make sure to ask Dr. Ehle at your next appointment! Benefits of Stem Cell Therapy? Want to Advance Research while Getting Your Stem Cell Treatment? Dr. Ehle is participating in a National Research Trial on Stem Cells with Regeneris Medical. If you have decided to have stem cell treatment and would like to donate your medical information to help advance research, please let us know! Your voluntary participation is invaluable to us and could help advance medical science so that one day we might be able to have more effective and faster cures and treatments. Platelet-Rich Plasma or PRP is a concentrated form of specialized growth factors and fluid that is extracted from a sample of your very own blood. We draw anywhere from 60-240 cc of your own blood and spun around in a machine called a centrifuge that separates the blood out into its components and allows us to isolate the plasma and growth factors that are then concentrated to form your PRP solution. The effectiveness of PRP is largely dependent on the quantity of platelets obtained in this process. The type of centrifuge and kit that we use at Well Life is able to concentrate platelets by 5-7 times their baseline which is enough to stimulate the production of new blood vessels and connective tissue in the area treated. The other variables that can change the effectiveness of PRP are the levels of white and red blood cells found in the PRP. In general, Red Blood cells are inflammatory and do not contribute any regenerative effects. These are minimized in our processing of the PRP by utilizing a two spin technique, that first removes the Red Blood Cells and then concentrates the platelets. In the end we are left with a Pure Prp that is ideal for both musculoskeletal and aesthetic indications. Ozone gas may also be added to provide rapid oxygen to your body to aid the healing process. At the microscopic level, PRP stimulates the production of new blood vessels and connective tissue. ligamentous laxity predisposing to tendon and joint pathology. Proper bio-mechanical alignment is assessed in order to address the abnormal forces that caused the pathology in the first place. Inspired by a 100-year-old treatment, AmnioFix, also known as a micronized dehydrated amniotic/chorionic membrane allograft, is a special type of regenerative tissue graft that harnesses the powerful tissue from placentas of healthy mothers and babies. This powerful regenerative tissue is injected into the affected area to alleviate scar formation and assist in healing. It is a fast treatment that can be performed in the clinic by our certified and trained practitioners. Prolotherapy, short for “Proliferative Therapy,” is an experimental treatment designed to treat problems related to tendons and ligaments, the connective tissue rubber bands that hold our joints together. A dextrose or sugar-based solution is injected into the affected tendon or ligament, which sparks the body’s own inflammatory healing cascade that results in tightening and healing of the tendon and ligaments by activating fibroblasts, the cells that produce the collagen that makes up our tendons and ligaments. Over many years, Dr. Ehle has witnessed the incredible power of prolotherapy and today, teaches the techniques to clinicians around the world. If you have tried other therapies without any results, Prolotherapy might be a good option for you. I have Diabetes. Is Prolotherapy safe for me? Studies have shown that the dextrose injections do not effect blood sugar and are not a risk for patients with diabetes. What Can I expect after having Prolotherapy? You will experience some increased pain in and around the injection site for a few days after treatment. You may relieve this using ice or Tylenol. You should be able to drive yourself home after a treatment, but a driver is always a good idea. Please avoid using anti-inflammatory pain medications (NSAIDS) like ibuprofen, naproxen, or Advil following the injection. Results will vary depending on your lifestyle, diet, and severity of the injury. The average number of treatments is usually 3-10. Where do I find more information about Prolotherapy? You may visit www.getprolo.com or www.doctorreves.com for more information. The Video below is of Dr. Fields, a physician, with whom Dr. Ehle worked with, while on a medical mission to Honduras. Here is a video produced by Dr. Jose Barreto, another physician, with whom Dr Ehle worked with in Honduras regarding research in Prolotherapy. All statements and opinions provided by this website are provided for educational and informational purposes only and we do not diagnose, provide medical advice or treat via this website or via telephone. Will PRP, Prolotherapy, or Stem Cell Therapy Cure My Medical Condition? No. With chronic health problems, there is no cure-all solution, and one needs to attend to one’s entire health by optimizing nutrition, stress, and exercise. Depending on your medical situation, regenerative therapies can be a powerful addition to accelerate healing. Will my treatments be covered by insurance or Medicare? No. New treatments that are under ongoing research investigation are generally not covered by insurance. Question Last – How do I schedule an appointment to learn more? Well Life Family Medicine is not representing or offering “stem cell therapy” as a cure for any condition, disease, or injury. No statements or implied treatments on this website have been evaluated or approved by the FDA. We do participate in registered FDA clinical trials (called IRBs) and these can be viewed on their website at www.clinicaltrials.gov. This website contains NO medical advice. All statements and opinions provided by this website are provided for educational and informational purposes only and we do not diagnose or treat via this website or via telephone. Well Life Family Medicine and its affiliate treatment centers are offering treatments that are in the investigational stage to provide individual patients with tissue Stromal Vascular Fraction that contains their own autologous stem cells and growth factors. These centers provide minimal surgical procedures only and are not involved in the use or manufacture of any investigational drugs.Cellular & Biocellular Regenerative Medicine represents a VERY important for potential for patient care, and suggests each do their own research based on the options that we present so that one can make an informed decision. Any decision to participate in our patient funded clinical trials and protocols is completely voluntary.